From Hands off Ireland! (Issue No 5) prior to the 1979 general election explaining why we oppose Labour. The Labour Party reveals its pro-imperialist and racist character more clearly on the Irish issue than any other. In 1949, it was a Labour government which passed the Government of Ireland Act which was designed to strengthen the Loyalist ascendancy in the Six Counties. Twenty years later, in 1969, another Labour government sent troops into the Six Counties to suppress the struggle of the nationalist working class. Five years later, yet another Labour government passed the racist anti-Irish Prevention of Terrorism Act (PTA). In 1976, the same government withdrew special category status [for Irish prisoners – FRFI] and created the torture blocks of Long Kesh. In 1977, the same government announced the expansion of the RUC, UDR and SAS. Since December 1977, the SAS has been responsible for at least eleven assassinations in the Six Counties. The Labour government is presiding over a systematic terror campaign against the Irish people. The so-called left wing of the Labour Party has done nothing to oppose this racist pro-imperialist government. Indeed left MP Stan Newens recently referred to the Republican movement as ‘fascists’ and Syd Bidwell signed the Select Committee report on immigration which is an openly racist attack on black workers in this country. And those MPs who have been touted by the Communist Party of Great Britain and the radical left as defenders of the Irish people have offered nothing more than the occasional speech at left gatherings and the occasional question in the House of Commons. On 15 March this year the PTA came up for renewal in the House of Commons. Only 23 Labour MPs opposed it. Three of these 23 were in favour of a three-month extension. All of those who spoke against renewal argued that the police already had adequate powers. None of those who spoke against the Act mentioned self-determination for the Irish, or called for the withdrawal of British troops, or attacked the torture programme of the British state. This was the left’s campaign! Nothing but hot, or rather luke-warm air was offered. There is no choice in this election for the working class. This election offers nothing more than a choice of which set of torturers to oppress the Irish people. Labour torturers or Tory torturers? In these circumstances the Revolutionary Communist Group cannot support the Labour Party in the election. 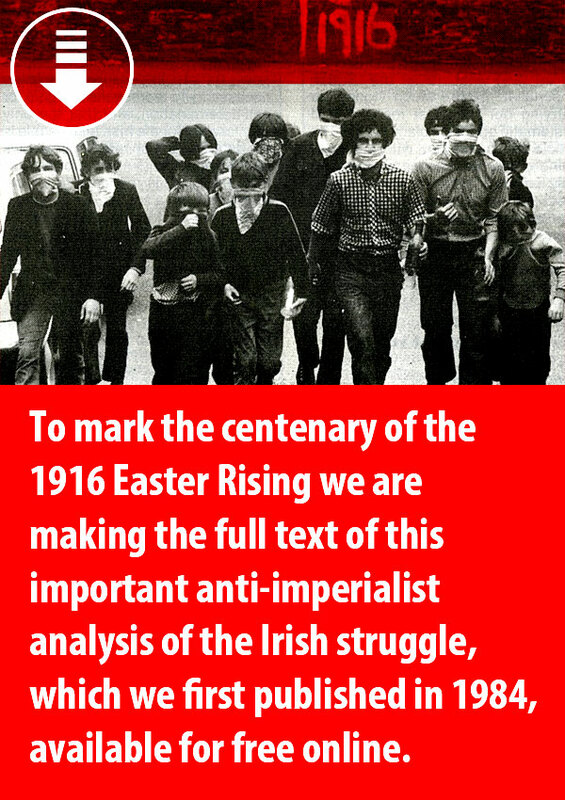 During the campaign we will raise the Irish issue and expose the pro-imperialist, racist nature of the Labour Party.